Providing a high standard of contemporary living, it is an excellent choice for both business and pleasure. The spacious bright sitting/dining room has four large west facing windows with views over Charlotte Square. There’s a six seater dining table and ample seating to sit and enjoy the 52" plasma TV with surround sound. Next door the modern fully fitted kitchen includes integrated Neff and Bosch appliances. Both bedrooms are excellent in size and both have TVs and zip link beds (two singles which zip to form a super king). The master has a superior en-suite shower room, comprising a double shower cubicle, Duravit sanitary ware and heated floor. The family bathroom is an elegant room, also fitted with Duravit sanitary ware, heated floors and beautiful floor to ceiling tiling. Ideally positioned, the shops of Princes Street are on your doorstep and the offices of Charlotte and St Andrews Square are a short walk away, whilst the lively bistros and bars of George Street and the West End are within easy walking distance. Recognised stores such as Jenners, Cruise, Louis Vuitton and Harvey Nichols are all nearby, as are leisure centres, cinema, theatres and exclusive nightclubs. The apartment is fitted with a video entrance phone. 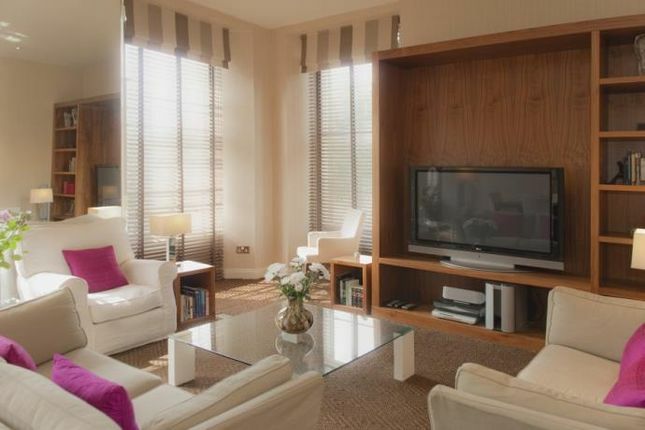 There is a double sofabed in the living room at additional £12 per person per night. Property descriptions and related information displayed on this page, with the exclusion of Running Costs data, are marketing materials provided by Rooks Estate Agents & Lettings, and do not constitute property particulars. Please contact Rooks Estate Agents & Lettings for full details and further information. The Running Costs data displayed on this page are provided by PrimeLocation to give an indication of potential running costs based on various data sources. PrimeLocation does not warrant or accept any responsibility for the accuracy or completeness of the property descriptions, related information or Running Costs data provided here.